v. : ill. ; 26-28 cm. will hecm ffeotba July 2.
pe4uaostaiAitast Chief of the Division. counseling and an orientation on personnel activities. tion from American University in 1970. 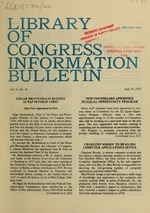 Library of Congress Publications . News in the Library World ..
ities in the Training Office at the Navy Yard Annex. pete for better jobs under the LC posting system. in the fall, is available from the Training Office, ext. Wednesday, and Thursday from 12 to 1 p.m.
Sutherland, Cop Serv, and Dona Wood, Cop Ref. brary unofficially as an adviser until June 30, 1955.
graphs to old master prints. came Curator of Fine Prints the following year. in 1950, his M.A. in 1954, and his Ph. D. in 1960, Mr.
Nouvau (Museum of Modern Art, 1960). Mr. Fern's appointment is effective July 2.
the rear of the Main Building. direct staff contact, an essential part of the program. The Officers are Stephen Langone, MB-133F, ext. 5821; and Katherine B. Meyers, A-4028D, ext. 5375. The Counselors are Rita W. Aufricht, CMA 414, ext. Cathy J. Douglass, NYA, ext. 6109; Mattie T.
Eugene Nabors, MRR Gallery, ext. 5083; Barbara B. Petty, MAA, ext. 5983; Lee E. Stinner, A-1040, ext. national library, and as the Library for Congress." offices ISO is now assisting. involved in work for the underprivileged. sas A&M and the Georgetown University Law School. Deputy Librarian of Congress John G. Lorenz. Not pictured are Mr. Belshes. Mrs. DuPree, and Mr. Langone. Ann Curtis, Denise Jones, Elizabeth Teasley, and Jan Langford. Not shown are Oather Dunlap, Naomi Glover, and Cheryl Kelly. He had been a Washington area resident since 1936.
two daughters, and a brother. George Washington University Hospital on June 13. After coming to the United States in 1946, Mr.
volumes by other Lithuanian writers. reference collection for the entire division. Charles G. LaHood, Chief of the Division. Rebecca A. Wright, clerk-typist, GS-4, E&G, 4863. Reignaions: Denise J. Blanchette, Cat Publ; Catherine H.
man, Cat Publ; Otto D. Morgenstern, Desc Cat; Roscoe F.
Perkins, Procurement; Barbara A. Smith, E&G. cooperation with the Smithsonian Institution. life. A question and answer session followed the talk. Library, served as program chairman. American Embassy, New Delhi, India. Mrs. Patricia Davis, Arthur G. Renstrom, and Mrs.
revision of a listing originally issued in August 1972.
ment. Particulars are available from the publisher. Department C-196, Washington, D.C. 20540.
as the legislative body of the District government. the topic "Copyright and Audiovisual Materials." was Abe A. Goldman, Acting Register of Copyrights. Register of Copyrights, also attended the meeting. a panorama of current Federal document activity. age should soon approach 75 percent of the trade. gram on an agency by agency and item by item basis. A spirited question and answer period followed. librarians from the Caribbean area. Donald F.
opening session held at the Trinidad Hilton April 29.
dressed the opening session of the Conference. Dr.
in the Latin American and Caribbean region. Index to SALALM Progress Reports: 1956-1970,"
Board, Jane Garner, University of Texas, and Earl J.
including guidelines for a pilot interviewing program. : (ACURIL) would be held in Miami, November 19-25.
of Libraries and Librarianship in Chile" by Juan R.
program he was initiating as a successor to LACAP. the acquisitions and cataloging services of his firm. rent cataloging data of Latin American imprints. Dr.
high priority to the cataloging of Latin Americana. ment Program of the OAS. dadian homes. The hospitality was superb. Exchange or the British National Book Exchange. Venezuela Unavailable in U.S. Libraries: A Survey"
efforts and programs have been planned. The final session was held on Wednesday afterta ! !a i ii.! the December 1972 disaster. Mrs. Shepard strhig'4"
by the earthquake and resulting fires. OAS is anti . [Mary Ellis Kahler and Donald F. Wiisom!